Sometimes I get emails from readers of AUSringers that make me want to scream. I mean this in the nicest possible way, of course. I don’t want to scream because they have frustrated me, or because they have done anything wrong. I want to scream simply for the experiences they have lived. Today was one of those days. Wayne Moore (in the blue cap) seems like a great bloke, it has to be said. However, for the fact he has driven in every Nürburgring 24 hour race since 1994, he deserves my ire! To make matters worse, his more recent exploits have been at the wheel of a three door Volkswagen Golf GTI. I have a three door Golf GTI, and would give almost anything to drive it around the Nordschleife. I have an extraordinary passion for the petrol-head paradise that is the Nordschleife and have had the privilege to now drive over 700 laps (17,000km) with an annual visit for the 24 Hour Race each year since 1994. My claim to being an AUSringer is that I’ve lived in Australia for the past 14 years and driven both Bathurst 24 Hour events although I’m currently based in Tauranga, New Zealand. I’d never been to Europe and never thought of going and now it’s an annual pilgrimage to satisfy an addiction to the Nordschleife. And I don’t think ‘addiction’ is too strong a word. This place is infectious! It doesn’t seem to matter how many times I visit the Eifel Mountains the magic and aura just compounds. I’ve had the privilege over the last few years to train first-time Aussie and Kiwi drivers and their awe after lap one or even first glimpses of the circuit through the trees is palpable. Just the sheer enormity of Nurburgring never fails to impress. This is “Wow!” with a big W.
PlayStation and Gran Turismo can help you learn the sequence of turns but are no substitute for feeling the undulations and camber of this extraordinary piece of tarmac. I guess a parallel is having no real concept of how steep Mountain Straight is, or how spectacular the drop from Skyline until you walk or drive Bathurst. 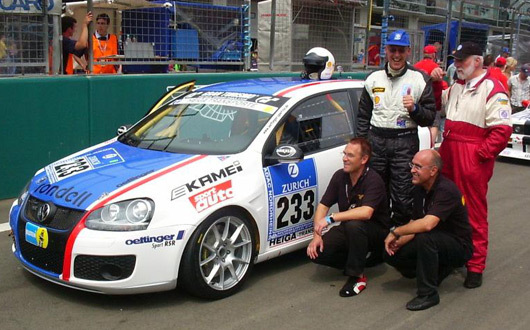 Florian located two German brothers Eberhard and Norbert Rattunde to join our driving team. They were from Volkswagen in Wolfsburg and brought a crew with them who ensured that the little car (albeit a Suzuki!) kept going until the finish. One year down… and the addiction had begun. 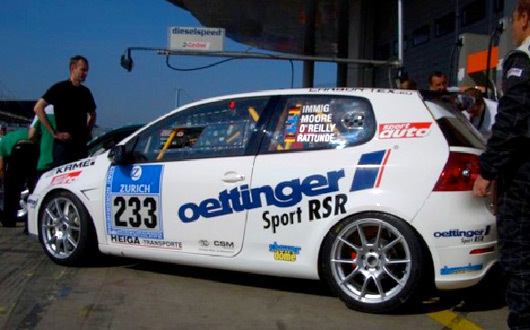 Since then Eberhard has led the development of Oettinger Sport RSR (not to be confused with RSR from Nurburg who feature on these pages) who are now a Volkswagen works-supported race team and I’ve joined them every year. 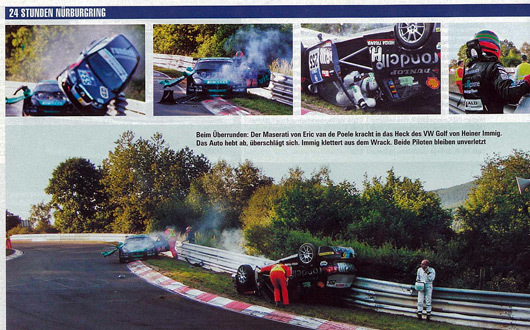 The team are like many in Germany and are Nurburgring ‘specialists’. 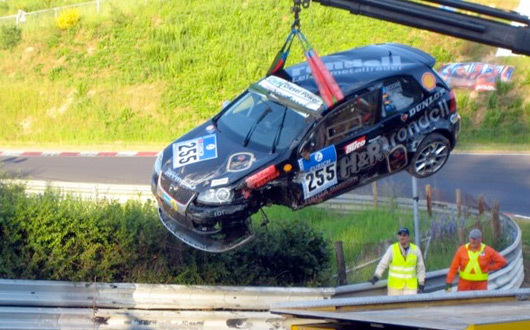 RSR irregularly contest the VLN series of 4 Hour Races held on the Nordschleife. We’ve ventured to Dubai twice for 24 Hour Races and also hold the 4, 6, 8, 12 and 24 Hour endurance records in New Zealand for diesels, with an RSR car that now lives here. Of course, we always race Volkswagen products and that’s included a petrol 1.4l Polo, a 1.8l Golf II and a 2.0l Golf III touring car and more recently a series of 1.9l diesels—Bora, Golf IV and Golf V with the growing global focus on alternate fuel technologies. BMW are our major alternate fuel competitors and often front with some pretty rapid prototype machinery which is becoming more reliable! It is worth noting, BMW won the race outright with a diesel 320d in 1998. Since 2008 we’ve been back to the drawing board and this year’s Oettinger car will include new Golf VI engine and mapping technology and a new aero pack which should help close the gap. Horsepower is generally unspoken, torque is unbelievable, and the cars will chirp their tyres changing from fifth to sixth and are usually geared to run 245km/h on Dottinger Höhe and at Schwedenkreuz and not much less down Fuchsröhre. For the first 12 years we could almost do no wrong. There were so many magnificent German trophies on the shelf when we moved houses once that the shelf fell off the wall. And then a couple of years ago we experienced the other side of the motor racing coin when I didn’t get to drive a single race car lap despite flying 24 hours each way to do so. We had technical problems during both qualifying sessions which chewed up the entire 6 hours, so we needed a dispensation to race without practice. 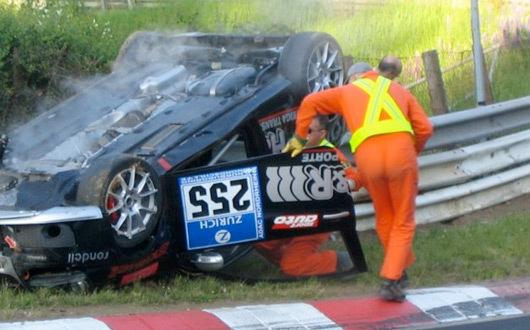 No issue there, until the car was destroyed in a collision with a passing Maserati during the fourth hour of the race. It felt quite strange, and sad, drinking beer throughout the Sunday of a 24 Hour Race I should have been driving. Last year a record crowd of 220,000 fans camped in the forest and filled the pensions throughout the Eifel to overflowing for the four day motorsport festival, which starts on Thursday and culminates with the running of the 24 Hour Race. 250 teams from around 30 countries enter the event and support classes include another 400-500 cars. Teams comprise multi-million euro factory operations right through to groups of mates running a club car. A growing number of Aussie and Kiwi drivers are competing which makes a welcome change from when English was hardly a spoken-language in pitlane. This is an amazing spectacle and an awesome event to align with a Euro holiday. 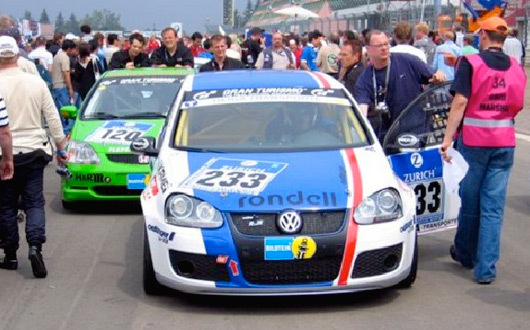 http://adac.24h-rennen.de/ Endurance race pits are open to spectators (with the right ticket) and there’s a great camaraderie. 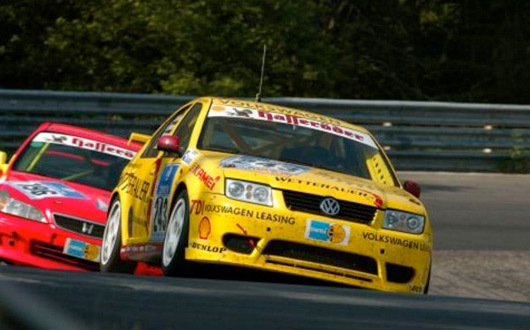 Dates for 2009 are 21-24 May, and I expect the Nordschleife to be open for tourist laps until Mon 18 May (although it gets pretty crazy over that weekend) and then again from Tue 26 May. I’m looking particularly forward to my Nürburgring visit in 2009, as a massive €215m development project should be complete. It comprises new grandstands, Welcome Centre, Indoor Attraction Centre (read Museum, Theme Halls, Go-karts), cafes, restaurants, a second hotel, an Eifel Village and fan shops. It is scheduled to open for the event. The old (well, only 7 years or so) Erlebniswelt theme hall and museum was good for a full day, so allow at least that to explore this new complex, then come and say “Hi!”. Wayne is a great guy and this German race is what he enjoys and looks forward to everyday. What a great story to share. I am sure that the infection will not be cured even if you have multiple doses of endurance panacea. All the best next time you head across and be sure to keep AUSringers informed – I heard Liam is a great crew member for auto events too BTW! Thanks for sharing your story Wayne and thanks for posting it up Liam. Brilliant stuff. Wayne I love your story, it’s awesome. It is a privilege knowing you. You are an awesome friend and a very helpful and cheerful person. Having worked with Wayne in the past, it is facinating to hear about his passion for racing, and the stories that come from that passion. Fantastic man, great story. Speed Safely Wayne! I have heard bits of the story many times from Wayne who is really a great bloke! This article put the little bits of stories into perspective and left me saying, “Wow!” Well done Wayne, I think your story is a great inspiration to others – despite the fact you live in New Zealand! May you have many more happy years driving the Nurburgring. Great to see so many of you have an interest in the nurburgring. I`m looking forward to welcoming Wayne again this year, he has been our guest every year since 1994. What`s missing in his story is that I´m still in the team as timing-and radio-crew and it`s always great to hear his comments on each lap as he passes through the finish-line. I`m shure we will have another great finish this year!!! I meet Wayne since his first race at the Ring each and every year there and it is ALWAYS a big pleasure! Can’t wait to see you again in 2009! But Wayne forgot to tell, that he had his famous 10 minutes, when “Radio Le Mans” http://www.radiolemans.com/ interviewed him at the 2007 race. Thank you all for your amazing comments and thoughts. There may only be 3 or 4 names on the window of an endurance race car but there’s many more people ensure the car gets to the race track in the first place and is reliable enough to stay out there. And of course there’s even more ‘along for the ride’. I appreciate that support and look forward to sharing many more adventures with you.